@BCSilverAlert We have just spoken with VPD Non Emergency. She has been found and transported safely. The following alert originated with the Vancouver Police Department. Vancouver Police are asking for the public’s help to find an elderly woman who has not been seen since early this afternoon. 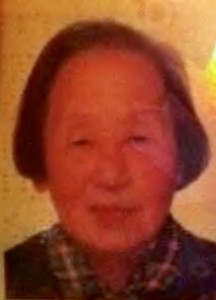 Seventy-seven year-old Esther Kwan was last seen around 1 p.m. in the area of Sasamat Street and West 10th Avenue. Ms. Kwan was heading to Macdonald Street and West Broadway to do some grocery shopping. Ms. Kwan is a Cantonese speaking Asian woman. She is five feet tall, weighs approximately 100 pounds, has black, shoulder-length hair and brown eyes. She was wearing a dark grey jacket, black pants and blue and white runners. Anyone who sees Esther Kwan is asked to call 9-1-1 and stay with her until police arrive. Posted in 2014 Alerts, Cancelled and tagged SilverAlert, Vancouver.